With each year that passes there’s a ton of mistakes we’re all bound to make. One of those mistakes is saying YES to the wrong things. 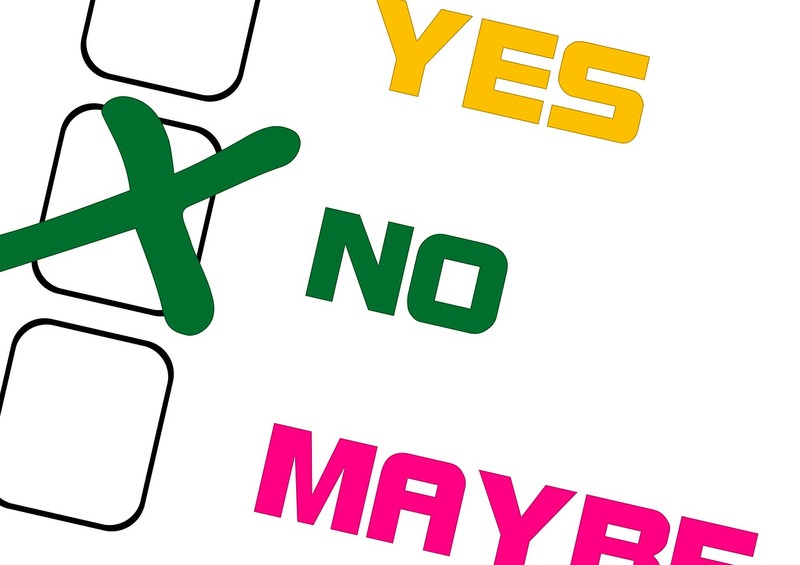 Here are 7 things to say NO to in 2016, so you can start saying YES to the right things. Say NO to thinking small in 2016. Thinking small serves no purpose. Especially if your “purpose” is massive in comparison. How can you expect to achieve big results if you’re too afraid to think big? How can you expect to run a high turnover business if your goals are small? How can you expect to live your idea life if your goals don’t motivate you? I asked myself similar questions not too long ago. I realized even though my goals seemed big, they weren’t big enough. Or should I say – they weren’t uncomfortable or unrealistic enough? Take whatever goals you have, and multiply them by 10. Then it’ll force you to think bigger and come up with a plan to make it happen. Say NO to self doubt in 2016. What I mean by that is – no longer allow your self doubt to get in the way of what’s important to you. When it all comes down to it, your dreams, goals, drive and purpose is all that matters. And it deserves all the attention you can give it. So whatever it is you’re in doubt of, just act on it and push through it. Don’t allow self doubt to cripple your goals in 2016. Say NO to being realistic in 2016. The ridiculous amount of times I’ve heard people say “that’s unrealistic” is outrageous. What they’re really saying is – that’s impossible for me, so there’s no way it’s possible for you. My answer to that is this. Is starting a business in your 50’s that ends up becoming the biggest fast food chain in the world unrealistic? Ray Kroc, founder of Mc Donald’s did it. Is building a mobile telephone unrealistic? Someone did it. Is publishing 1 book that ends up selling millions worldwide unrealistic? Robert Kiyosaki did it. Is expecting to be a millionaire by 31, but then becoming a billionaire by the same age unrealistic? Bill Gates did it. The point is, nobody ever achieved anything worth talking about with a “realistic” mentality. You can’t achieve what you’ve yet to achieve by thinking realistically. Realistic is what you have, unrealistic is what you want. So be unrealistic, believe it’s possible and make it happen. Say NO to multi-tasking in 2016. Put all your focus into either 1 thing or 1 thing at a time. You don’t need scientific proof to know multi-tasking is a dumb thing. You can’t write an article and have a conversation at the same time. It takes too much focus and energy. And each distraction can cost you 10-20 minutes of your time. Or more. The same goes for anything else that requires focus. Choose 1 thing to focus on, complete it, then choose another thing to focus on, and repeat the process. But don’t trick yourself into thinking it’s quicker to do it all at once. Because you’ll be sadly mistaken. Say NO to asking for permission in 2016. Want to pursue your dreams? Want to quit college or university? Want to move to another country? Want to quit your job for a job that fulfills you? Want to start your own YouTube channel? Want to pursue the career you want, instead of settling for less? Want to advertise what you’re selling? Then STOP asking for permission and DO IT. If you wait around for others to “permit” you to do something, you’ll be dead by the time they do. Take action right now. 6. The voice of your fears. Say NO to the inner voice of your fears in 2016. We all have fear, I have fear. Fear is completely normal. Think of your fears like Goliath. The longer you hold out on your fears, the bigger your fears appear to be. David defeated Goliath because he was bigger than his own fears, so Goliath didn’t seem as threatening as he did to the Israelite’s. Your fears are no different to Goliath. And the only way to defeat it is to face them head on and act bigger than the thing you’re afraid of. Then your fears will fade away. Say NO to criticism in 2016. It’s none of your business. If I spent all my time and energy on criticism, I’d have no energy left for myself or my priorities. If big singers like Katy Perry spent ALL their time on criticism, they’d no doubt be miserable and depressed. What a critic says about you says a LOT more about themselves. Criticism is a reflection of the person criticizing. So pay no attention to it, and put all your focus into positive aspects of your life. Things that will benefit, help, encourage, inspire, uplift and push you for the better. As opposed to things that will drag you down, ruin your day, stress you out and distract you from what’s important. Don’t let doubt stand in your way. You don’t need permission to take action. Theo Ellis is a straightforward blogger who’s creative by nature, and committed to making a difference. He focuses on confidence building, motivation and personal development on his blog – Just Be Real.